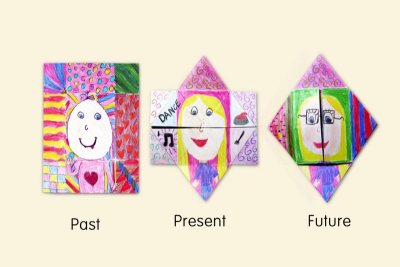 Students create a small never-ending card that shows them at three stages of life – the past when they were a baby, the present, and the future, when they will be an adult. They practice folding the card smoothly through the 3 images and then they use it for storytelling. Draw an 'X' from one corner of the paper to the other. 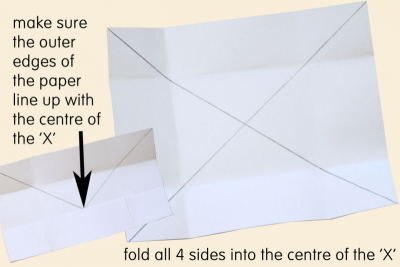 Fold all 4 sides of the paper into the centre of the 'X'. 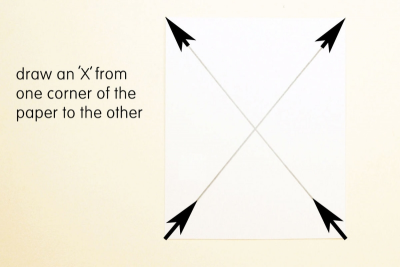 Make sure the outer edges of each side of the paper line up with the centre of the 'X'. Turn the paper over so the 'X' is facing down. Draw picture #1 on the side that does NOT have the 'X' on it. Use lots of colour and pattern to fill in the whole space. This drawing should be of you as a baby. Turn the paper over so the drawing is facing down. 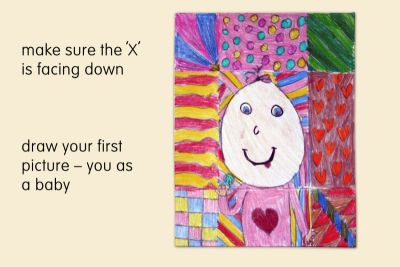 Place it on a cutting board and make sure the 'X' is facing up. 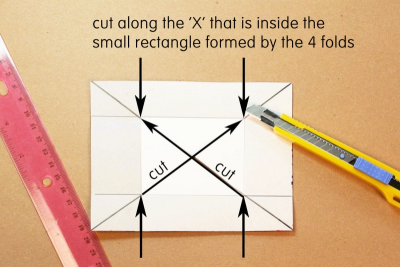 Use a box cutter and a ruler to cut along the 'X' that is inside the small rectangle formed by the 4 folds. Hold the card with the picture facing you. Gently fold the top edge down towards you. Be sure the little cut triangle pops up. Fold the bottom edge up towards you. Be sure the little cut triangle pops down. Flatten the paper and draw on this new space. This picture should be of you as you are now. Add details that tell something about you. Hold the card with the new picture facing you. Fold the side flaps into the centre. Make sure the little triangles pop out to the side. Colour your last picture in this new space. This picture should be of you in the future. Notice how the top and bottom of picture number 2 and picture number 3 are the same. Practice moving smoothly from one picture to the next. Begin by doing it with the card facing you. Once you are good at that, practice with the card facing an audience. Repeat the folds over and over again while you tell a short story to go along with the changes. present their never-ending stories to students in other grades. 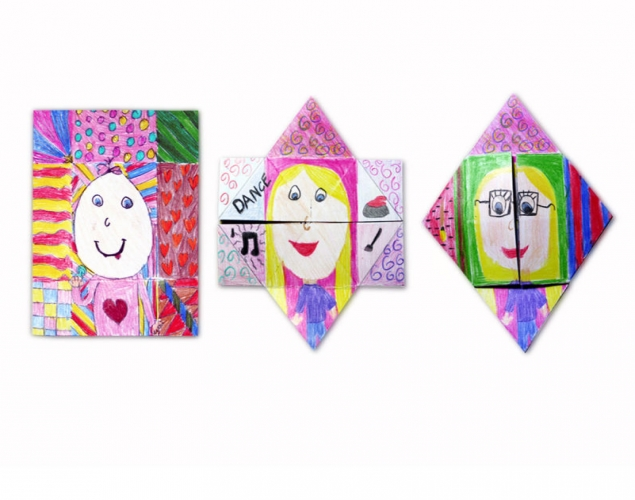 Cut enough paper for each student to have one piece. Gather and make available books about jobs and careers, for example, What Do Grown-ups Do All Day?, by Virginie Morgand; Mighty Mommies and Their Amazing Jobs: A STEM Career Book for Kids, by Donald Jacobsen, and Graham Evans; The Beeman, by Laurie Krebs, and Melissa Iwai; National Geographic Readers: What Is an Archaeologist?, by Libby Romero; and Wild Work! Animal Trainers, by Jessica Cohn. Gather and make available books about family history, for example, The Proudest Blue: A Story of Hijab and Family, by Ibtihaj Muhammad, S. K. Ali, and Hatem Aly; The Quilt Story, by Tony Johnston; The Keeping Quilt, by Patricia Polacco; The Name Jar, by Yangsook Choi; and Stepping Stones: A Refugee Family's Journey, by Margriet Ruurs, Nizar Ali Badr, and Falah Raheem. Read a story about family history to get students thinking about their own past and relatives who might inspire them as they think about the future. Ask students to think about what they were like in the past. - How far back can you remember? - What did you look like as a baby? - What stories do your parents tell about you? - What is your favourite family story about you? Create a never-ending card with three distinct pictures. Picture #1 shows you as a baby. Picture #2, shows you as you are now. Picture #3 shows you as an adult. Use contrasting colour, pattern and detail to communicate ideas about you. Demonstrate how to fold the cardstock. As students finish their first picture have them come to a designated spot. Cut the 'X' for them using a box cutter. 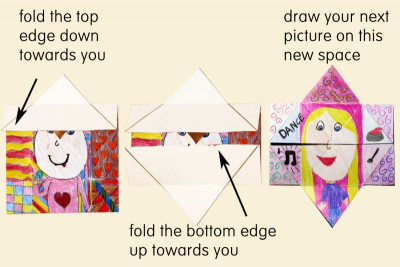 Demonstrate how to fold the paper for the 2nd drawing. Remind students that the top and bottom triangles of this picture will also be the top and bottom triangles of the last picture. 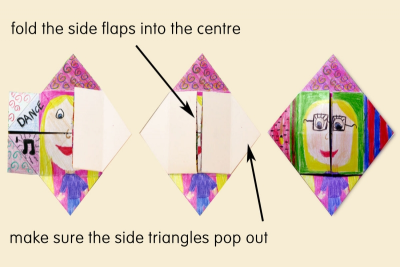 As students finish the 2nd drawing demonstrate how to make the last fold. Continue to guide students through the steps outlined in this lesson plan. After everyone has had a chance to share in partners have some students flip through their entire card telling stories as they go. - What was the best thing about it? - What was the worst thing about it? Ask student how they might use this never-ending card in a different way. 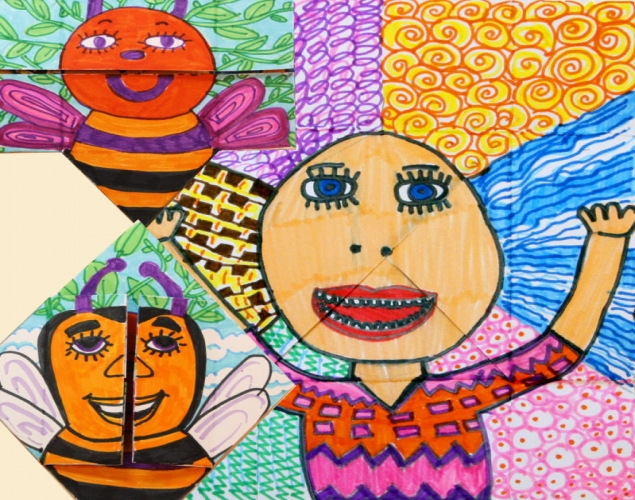 Observe students as they discuss the never-ending cards – active listening, insightful contributions, supporting ideas with evidence found in the artwork and from personal experience.